SeaWorld Camps Returning to Orlando! Summer is right around the corner and SeaWorld Camps are returning to offer educational, fun and exciting encountersfor kids of all ages. The camps include up-close experiences with marine animals designed to encourage a lifelong passion for wildlife and the environment. Campers are immersed in the wonders of the sea through up-close animal discoveries, exclusive behind-the-scenes opportunities and amazing attractions, rides and shows. The opportunities campers receive are unequaled – first-hand experiences with veterinarians, animal trainers and animal care staff. SeaWorld Camps not only allow children to surround themselves with aquatic life and education, but they also make friends, have fun, explore the great outdoors, ride world-class coasters and create lifelong memories. SeaWorld Camps offer a learning environment that fosters exploration, inquiry, self-discovery and self-esteem with two offerings: traditional Day Campsand “sleep-away” Resident Camps. Day Camps: During their particular week at SeaWorld Camp, participants learn about a variety of animals, including whales, dolphins, penguins and sea lions. Campers will focus on a different animal each day and learn about them through songs, take-home arts and crafts, as well as by talking with the zoological staff. Day Camps are offered for children going into preschool through 8th grade. Lunch, snacks, a camp T-shirt and water bottle are included. Resident Camps: Make it a summer to remember for students going into 7-12th grade with a Career Camp. Campers experience what it takes to train and work with marine animals and have the opportunity to touch a penguin, snorkel in a shark cage, work with the animal care staff and create an enriching environment for the animals at SeaWorld. Plus, participants have the opportunity to spend a day at Discovery Cove® swimming with dolphins, snorkeling with tropical fish and rays, and feeding exotic birds in a free-flight aviary. Resident Camp fees include all camp activities, lodging onsite at SeaWorld® and at SeaWorld’s partner hotel for five nights, plus all meals and snacks. Supervision and guidance is provided 24 hours a day for the entire duration. Many campers fly in from around the country – these campers are picked up at the Orlando International Airport by the dedicated camp staff and brought to SeaWorld to start their camp experience. For nearly 25 years, SeaWorld has provided safe, fun and educational camp experiences for kids of all ages in the not-so-traditional setting of a world-class theme park. 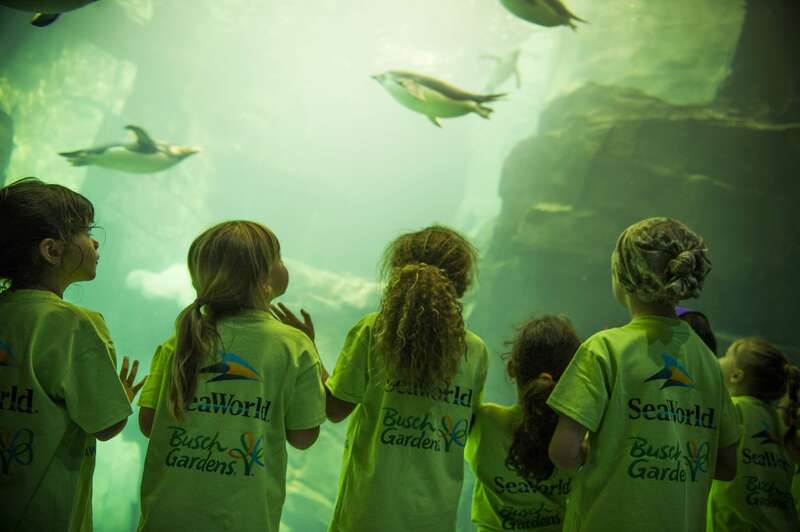 In the last 10 years, more than 250,000 youth have attended a SeaWorld and Busch Gardens® Camp. Previous Post Tickets Now Avaliable For 6th Annual Food and Wine Classic at the Walt Disney World Swan and Dolphin!